Dun Laoghaire is the perfect place to get out and about for some family fresh air. It’s the real-life Playstation with no downloads! Founded at the end of the 19th Century, the landscaped park is open to all and is a haven for families. Bring the picnics, bring the ball! There’s even a new playground for kids to spend hours of fun and a coffee shop to keep parents happyThe park especially comes alive on a Sunday as market traders bring their delicious food-stuffs and artistic crafts from all over Ireland. You may not have mastered Ulysses but the whole family can conquer the James Joyce Tower which holds a museum devoted to the life and works of the famous Irish author. One of a series of Martello towers, built to withstand an invasion by Napoleon, the tower was the setting for the first chapter of the masterpiece that is Ulysses. The museum collection includes letters, photographs, first and rare editions and personal possessions of Joyce and the little ‘uns will especially love exploring the gun tower and wondering at the panoramic views. Charlotte is located within the Honeypark development on the lands of the former Dún Laoghaire Golf Club. Life at Honeypark offers a wonderful array of facilities just outside the door. The feature lake, with jetty and viewing deck, the children’s playgrounds, the multi-sport playing areas with tennis, basketball and football, the walks, seating areas and flora and fauna, all combine to deliver a most outstanding environment. If you life treasure maps, then you’ll love this! The Sculpture Trail contains an interactive map of the significant collection of public sculpture and monuments in the Dun Laoghaire/Rathdown area. The map details 39 pieces in total from the historic to the contemporary and there are a number of ways to follow the Sculpture Trail, from spending a morning in nearby Marlay Park or wandering through Dun Laoghaire spotting the many pieces around the piers. Shiver me timbers, kids and adults love this museum, which is sited in the Old Mariners Church. Check out a recreated ship’s radio room, a Titanic exhibition, a maritime art gallery and even tiny models put together by lighthouse keepers during lonely shifts on duty off the coast of Ireland. In case you do get carried away with the thousands of exhibits, the massive anchor in the museum courtyard will keep you grounded. You can’t have a family day out without ice-cream, even it is in Baltic conditions. And there is no better place to go for a frozen fancy! Teddy’s claim to be the home of the 99 and have been selling the same creamy vanilla recipe since it was founded in 1950. They are also the original sweet shop, so now you can introduce your children to memories of boiled sweets, iced caramels and candyfloss.And there’s also Scrumdiddlys where you can choose from 2,400 combinations. Decisions, decisions! We say a family that walks together, talks together! If that’s true, you can’t beat Dun Laoghaire for the amount of varied walk, either on the sea front or in the surrounding hillside that it has to offer. From a 2.6km around Dun Laoghaire Pier with great views across the bay to the West Pier Walk with the 1852 lighthouse and seals bobbing up and down, the sea really is your oyster in this regard. There’s also the Metals Walk and nearby Killiney Hill with surfaced paths and even woods to explore. 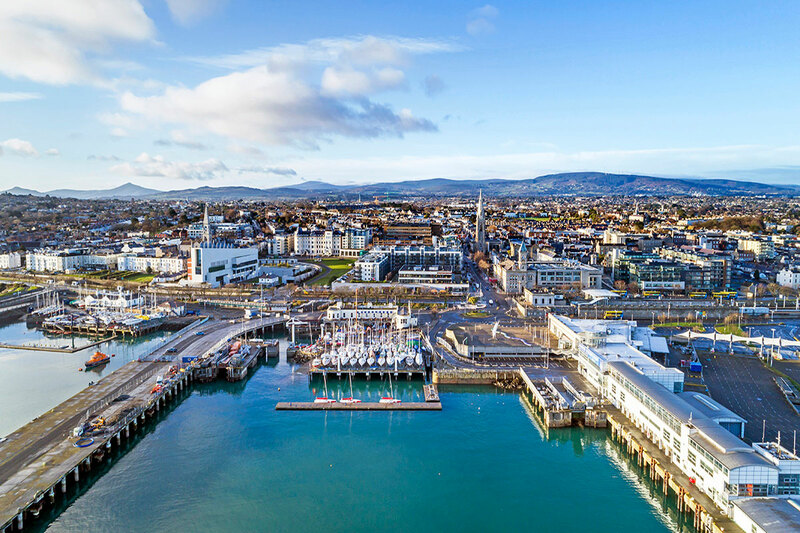 Most kids love water and there’s an endless number of options when in Dun Laoghaire, from swimming off the forty-foot to trying sports such as stand-up paddle boarding and sailing. Most companies offer courses for all ages and levels by fully-certified instructors.